Mercury, Venus, Mars, Saturn and Jupiter are about to line up, for the first time in more than a decade, letting us to observe them with naked eye. This arrangement has been visible since 20th January 2016. But the planets will be more apparent as we step into February and the best day to spot these celestial objects would be 5th of February. 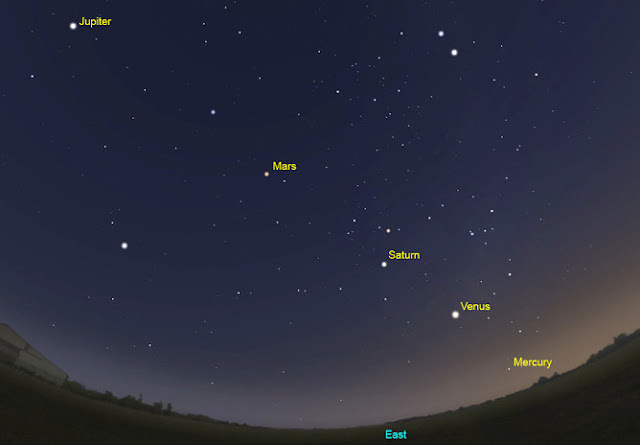 These planets will remain aligned and be visible till 20th February. One 5th of February, the Earth will be facing away from the center of the galaxy, giving us the view of these five planets together and way more clearly. The Moon has also merged with these planets and will remain until 8th February, and then it will appear as new moon. To experience this event, we first have to detect the Moon, and all other five planets would be along its line. Venus and Jupiter would the brightest among them, and Mercury would be a little difficult to spot. So don’t miss this event because it’s not going to happen again until 2018. This event doesn’t have much significance in astronomy other than it is rare.